In May, a group of BRG senior colleagues gathered in Scottsdale, Ariz., for a series of conversations about the most pressing issues of our time. As part of the BRG Leadership Summit, several experts addressed questions and matters affecting our lives, our families and our businesses. We heard a new, data-driven perspective on the opioid crisis from the folks on our healthcare team. Our cofounder and chairman, David Teece, joined with colleagues to brief us on the implications of the autonomous-vehicle revolution. Our top human capital and cybersecurity experts delivered the latest thinking on gender pay disparity, human capital in the gig economy and the relentless drumbeat of data breaches. As sobering as many of those discussions were, I came away from the meeting with a new energy, fueled by a profound appreciation for our team and the deep thinking they bring to even the most complicated challenges. I see that thinking deployed for our clients every day, of course, but directing it toward global, societal issues really opened my eyes to the true depth of our knowledge, experience and creativity. 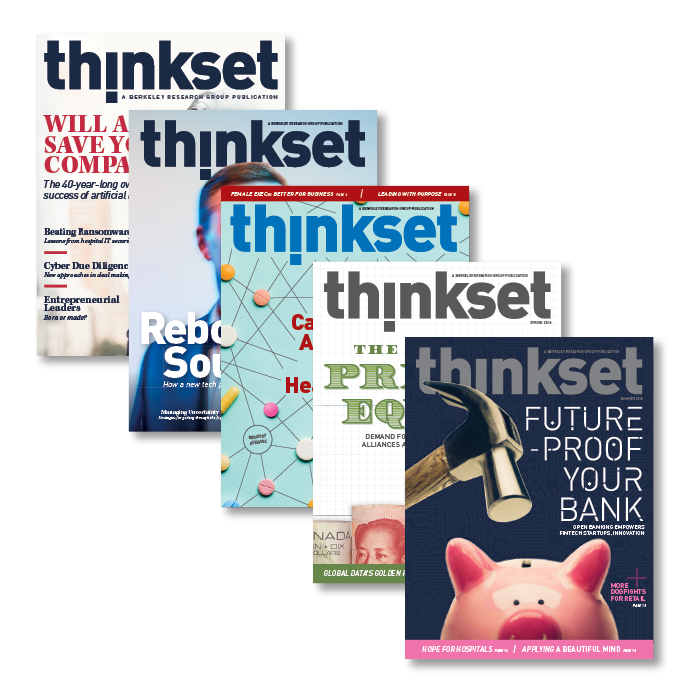 Reviewing this issue of ThinkSet, I felt a jolt of the same energy. In Issue 5, we bring fresh perspective to topics that are as profound and complex as the challenges we tackled at the summit. In these pages, you’ll find Naomi Bowman’s unique take on the burgeoning clash between traditional institutions and startups—of the kind we’ve seen disrupt many industries—this time in the banking world. Our retail team offers two distinctive views of the future of the storefront merchant. Haywood Miller and Peter Chadwick explore the plight of some rural hospitals—vital community safety nets experiencing crushing distress—and offer some battle-tested survival techniques. And David Teece offers observations about a potential new direction for American antitrust policy, one that could help spark a new era of innovation and invention. There’s more, of course: more insight, more provocative ideas, more incisive commentary. Taken as a whole, this issue fills me with the same kind of hope I felt leaving Scottsdale: that whatever challenges we face—as business leaders, as citizens, as human beings—we have the intelligence, the knowledge and the commitment to solve them. I hope you’ll feel something similar. As always, I’d love to hear your thoughts and feedback. The antiquated TCPA law meant to protect Americans from bothersome telemarketers has become a magnet for pricey litigation.